I picked up Crawfish Dreams on a recent trip to the local, indie bookstore. I love exploring their used book section, because you never know what gems you'll find. And though I didn't think the story was terribly exciting, I loved the recipes interspersed throughout the book. Camille Broussard is a Creole transplant from a small town in Louisiana to Watts. Moving from the south in the 1940s, she remembers a thriving community that changed with the Watts Riots in 1965. One of the last homeowners on her block, Camille refuses to leave the block she loves. Convinced that her cooking will pay off in a big way one day, she's constantly coming up with new side hustles. Camille's adult children are a motley bunch. From her practically virginal, yet married, 40something daughter to her overly Christian, in words but rarely actions, son to her confused and lazy lesbian daughter, and all of the kids in between, Camille hasn't got a leg to stand on. While her sons debate about which one should take their ailing mother in, and it certainly won't be the son that "made it," she's plotting to open a restaurant...in Watts...in her home. 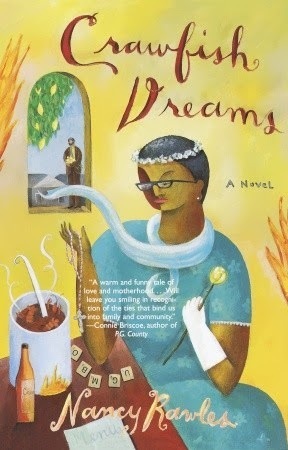 Rawles touches on a lot in Crawfish Dreams: the abandonment of whole communities; father-son relationships; recidivism; religion; self-esteem; families and starting over. Although I enjoyed the story line overall, the book had a tendency to drag. I think toward the end I had to force myself to finish it just so I could say I was done. It's not that the book was predictable, but there were sections and some stories that I felt could have been cut to make this a more compact read. I do, however, plan to try a few of the recipes listed in the book. I'll be sure to let you know how that works out.